Artwork Panel: 32.1cm x 59.3cm ≈ 12½" x 23¼"
Silk/Brocade: 41.7cm x 114.8cm ≈ 16½" x 45¼"
This wall scroll is discounted because a customer ordered it custom, and then cancelled the order. Nothing wrong with it. This is the most common transliteration to Mandarin Chinese for the name Karma. 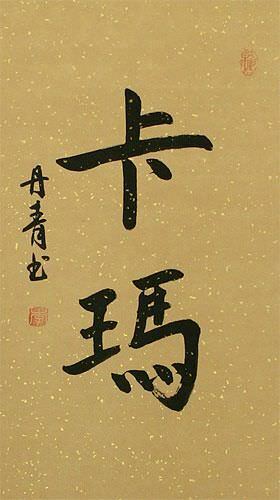 Note: This sounds like Karma, but does not have the meaning of Karma in Chinese. See our other entry if you are looking for the Buddhist idea of Karma. In fact, if your name is Karma, I strongly suggest that you use a word that means Karma, rather than this one which sounds like Karma.